The popular family ski area features an adventure run, a children's adventure land, a fun park with video camera and new different rails for slides, a photopoint at the Popolo II mountain station, the Andrea-Fischbacher-time-measuring and training slope, cozy ski huts and well-groomed ski slopes. On the extended adventure trail at the Popolo II mountain station, children are greeted by the monte popolo mascott and many new speeking characters. With it's claim to be "small but beautiful" and it's great family specials, monte popolo Eben has quickly become popular. This was impressively confirmed at the Skiareatest 2015 with the awards "Family ski area of the year" and "Best childrens offers". The "International slope quality seal" was also awarded to monte popolo Eben. Unspoiled skiing pleasure - monte popolo Eben is a small and easy ski resort, which offers perfect skiing fun for the whole family. A comfortable six-passenger chairlift with leather upholstery, child safety bars and weather shields, an adapted double chairlift and two practice lifts offer untroubled skiing pleasure. Free Wi-Fi in the alpine area - now you can share your holiday experiences for free and in real time with family and friends, send photos or all the app "Ski amadé Guide" - without roaming charges. The access points at monte popolo Eben are located at the Popolo I valley station as well as at the Popolo II valley and mountain station. The monte popolo Lounge - at the Popolo II valley station - invites you to relax. At the Popolo II mountain station there are also relaxing loungers. Take a breath and enjoy the fascinating mountain panorama! 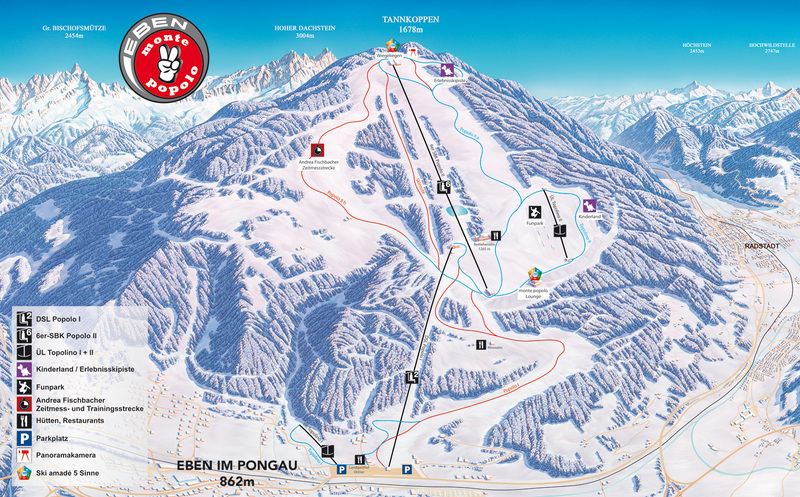 Easy to reach – the monte popolo Eben is located directly at the exit of the A10 Tauern motorway - about 60 km from the city of Salzburg and is also connected to the public rail network. More information about the ski area monte popolo on the phone under +43 6457 2221 or www.eben.at.